Harbour Park is a 45 hectare industrial park developed adjacent to Keefer Terminal. The development is located close to central business areas of the city. Harbour Park has fully serviced sites ranging up to 2.5 hectares. The Harbour Expressway, which extends to Harbour Park, offers direct road access to the Trans Canada Highway and to the United States. 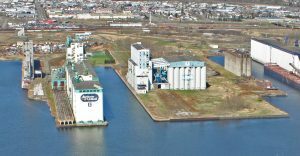 The development is administered by the Thunder Bay Port Authority which will, upon agreement, lease parcels of serviced land, participate in joint venture projects, and construct facilities for long-term lease. This site is available for immediate development. Contact the Port of Thunder Bay for more details.